Through my Grandmother, Cathryn White, I grew up with stories of Mr.and Mrs. H. N. White and the famous musicians that played King instruments. As my Grandmother aged, it became important to me that there be some way to remember those who designed, produced and played these special instruments. This web site is the perfect way to pay tribute to the hard work and dedication of my family as well as share my own King instrument collection with those who also appreciate the intricacy of these fine musical instruments. The purpose behind the web site. When I started making this web site, my purpose was rather simple in that I wanted to tell the H. N. White story. Like many things in life, the purpose has evolved. After searching the Internet, I found that most web sites are designed with the highest quality but lacked depth. These web sites focused around either large collections of instruments or artists with little or no mention of what brand of instrument they played or the people who made the instruments. My goal is to develop hnwhite.com around three basic ideas. 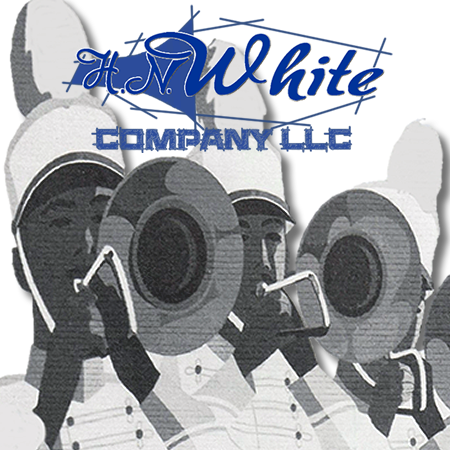 First, is to document the H. N. White Company history and be a resource of information. Second, is to tie famous artists to the instruments they played. And finally, to visually share a number of instruments that I have preserved for the sake of history. As with anything in life, there is always room for improvement and refinement. If the web site does not meet all of your expectations, please offer your suggestions for improvement. This the only website developed and maintained by the H. N. White family. This web site is the result of long hours of work and extreme dedication. If you have any information, or know of anyone who worked for The H. N. White Company, please let me know. Even the smallest piece of information can be a very big help! This website is dedicated to Cathryn (Kay) White who passed away on June 26, 2005. Cathryn was an important key to the H. N. White Companies success. She will be missed. I would like to thank my Grandmother for her never ending support with this endeavor. I would also like extend special thanks to Mr. Brant Chaisson, and all of the other people who have helped me develop and grow this web site. WWW.HNWHITE.com is a private collection and not a museum. A museum is typically defined as a non-profit, permanent institution in the service of society and of its development, open to the public, which acquires, conserves, researches, communicates and exhibits, for purposes of study, education enjoyment, the tangible and intangible evidence of people and their environment. This website does not endorse any websites calling for donations. For your own protection, should you chose to make a donation of any sort, please request a nonprofit identification number for your tax deduction purposes. You are either a private collector (like www.hnwhite.com) or a public museum run by a board of directors where no one person can enrich themselves in the name of the public. This website does not provide music on any of it's pages, but recommends that you purchase a Sirius radio subscription and you can choose what you want to listen to. "You have no idea how many commercials you are listening to!" Sirius can be played over the internet and has four jazz and big band stations not to mention some of the best content on the radio.